Set stove top to medium heat. Heat olive oil in a pot then add onion and garlic, cook for 5 min (or until aromatic). Add rice and coat with oil, onion and garlic. When edges of rice have slightly browned add 2 cups of water and 1/2 tsp salt. When water reaches a boil turn heat down to low and cover. Simmer until rice is cooked. Remove rice from heat and place in colander. Rinse with warm water. Place back into pot and add 1 tbsp cilantro and the juice of 1/2 lime then mix. All the while you've been warming your beans and corn (not in the microwave, obviously). Add your rice into a bowl then finish off with your toppings (to make this a vegan dish simply don't add the feta). 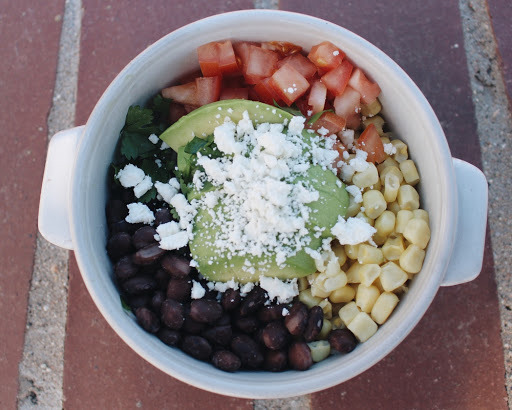 Rice bowls are awesome because you can mix up the toppings and make it your own. We like to squeeze a little extra lime and sprinkle with a bit more sea salt. I think next time we will even try some salsa on it!